Telangana Board 1st Year Intermediate Results 2019: The moment we all have been waiting for is here. TSBIE has officially declared the Telangana Inter 1st Year Result 2019 for the students who appeared for the TS Intermediate exams. Initially the Telangana Inter 1st Year Result 2019 was to be declared on April 15, 2019, but that report turned out to be hoax. For immediate access to the Telangana Inter 1st Year Result 2019, the result will be made available on the official websites- results.cgg.gov.in and bie.telangana.gov.in. Alternatively candidates can also download the TS Board 1st Year Result 2019 at telangana12.jagranjosh.com and results.jagranjosh.com. All those students who appeared for the Telangana Inter exams can check their TS Inter 1st Year Result 2019 online. Candidates are advised to keep a watch out for the latest update on the Telangana Inter 1st Year Result 2019 here. In the meanwhile, TSBIE has also urged students are also advised to stay away from rumours and speculative information that is being spread about the declaration date of Telangana Intermediate 1st Year Result 2019. To this end, jagranjosh.com will be providing you all the latest news and updates about the TS Inter Result which are verified and authentic. Students can book mark this page and visit this page tomorrow to get reliable information and to be able to check their result online. Here we will bring to you the latest news and updates on the Telangana Inter 1st Year Result 2019. The TS Inter Result 2019 will also be made available at bie.telangana.gov.in. 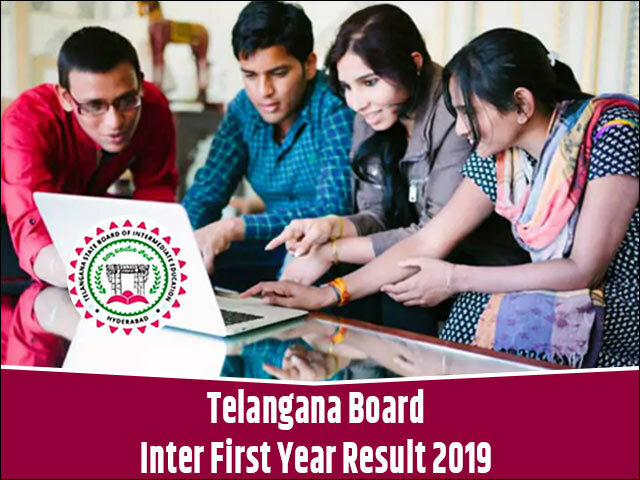 Telangana Board Intermediate Result 2019 for the 1st year students is expected on April 18. As per the reports coming from the BIE, Telangana – the TS Inter Result 2019 for 1st Year students can be accessed on the aforementioned date until further changes are made. After the completion of the Telangana Intermediate Board Exams, students will be under tremendous pressure during their wait for the TS Board Result 2019. Telangana Board 1st Year Intermediate Result 2019 are deemed to be a stepping stone for one’s further career, be it academic or professional, therefore the anxiousness if quite natural. For regular updates regarding the Telangana Board 1st Year Intermediate Results, students can bookmark this page and visit it regularly. Our team is keeping a close track of the developments at the Telangana Board office and will provide you all Telangana Board Intermediate Result latest updates here. Alternatively, you can also subscribe to get these alerts to be directly delivered to your mailbox. Please provide your details in the form provided above and you will receive all the latest updates about TSBIE 1st Inter Results 2019 regularly. The BIEP has successfully conducted the Telangana State Board of Intermediate Education examination with full strictness. After the completion of the examinations, the students will be anxiously waiting for their 2019 results as they are very important for their promotion to the higher class/degree. Such students need to wait patiently in order to check their TS inter 1st-year result 2019. Speculations will rise and numerous rumours regarding the possible declaration date of Telangana Board Intermediate Result 2019 will be afloat. Students should avoid believing any such malicious information available online and seek reliable info at reputable education sites such as Jagranjosh.com. Telangana Board 1st Inter Results 2019 are expected to be announced in the second week of April. With nearly, 4.5 lakh students taking the TS Board 1st Year Inter Exam, the competition is quite high even in the TS 1st Year Inter Results 2019. But to help students understand the general trend of Telangana Board 1st Year Intermediate Result and to help them set realistic expectations about their results, we have compiled a brief Result analysis of last year. If you are one of the students expecting your TS Inter Result 2019 soon, you should go through it in detail. It has been notified by the Telangana Board that the online Telangana Board Intermediate Result cannot be considered as a replacement of original mark sheets. The Telangana Board 1st year Intermediate Result mark sheets will be delivered to the students through proper channel within 15 days from the deceleration of results. However, the students should keep a hard copy/printout of the result to use them until the original documents are issued by the respective board so as to pursue the higher course. For candidates, who are unhappy with the marks secured by them in the TS Board Result, they can apply for rechecking and re-evaluation of their answer sheets. The Board of Intermediate Education, Telangana will issue a formal notification for the same soon after the declaration of the results. During the rechecking process, only the marks awarded to the students will be recalculated. While during the re-evaluation procedure, some boards allow the entire answer sheet to be re-evaluated by an independent examiner. The fees and the details regarding the re-checking and re-evaluation process can be obtained from the board website or from your schools directly. The students will have the option to apply for supplementary examination within 15 days if they were unable to qualify any paper. They can opt for of re-verification, recounting, or their obtained marks too, by paying a nominal fee along with the filled in application. After the announcement of the Telangana Board Intermediate Result 2019 for the 1st year students, the Board will issue guidelines and notification for the further action that needs to be taken by the students. Immediately following the declaration of the Board Result for 1st Year Intermediate students and they will be required to collect the marksheets from their respective Schools / Colleges. For those students who have failed or want to improve their score in the Telangana Board Intermediate Result announced this year, there is an option of the compartmental examination. The Telangana Board Intermediate Compartmental Result is expected to be announced in the month of July. This result will help you to either improve your score or apply to colleges on the basis of it. Jagranjosh.com will update this space with the details of the Re-checking, Re-evaluation and Compartmental Exam Results, after TSBIE issues a formal notification about it. The Board of Intermediate Education, Telangana was founded in 2014 after the formation of Telangana state from the territories of Andhra Pradesh. The Board is also known as TSBIE i.e. Telangana State Board of Intermediate Education. Since its formation, the BIE Telangana has been entrusted the task of regulation, supervision and development of the Intermediate level education system in the state of Telangana. Currently, the Board executes and governs various activities that include devising of courses of study, prescribing syllabus, conducting examinations, granting affiliations to colleges and providing direction, support and leadership for all educational institutions under its jurisdiction. Telangana Board has released the result of Intermediate exam on the official website. Know what is the aftermath of it. Telangana State Board of Intermediate Education has released the dates for the supplementary examination for the 1st and 2nd-year students. Candidates appearing can check the detailed time table here.